Genesis Sonic the Hedgehog in 18:28.25 by JXQ. Somewhat fast bouncing around. The lack of a spin-dash makes the strategy a bit different than the other Sonic runs, since it becomes a lot more important to preserve your momentum. Completed without collecting any emeralds. This is the first run of this game. 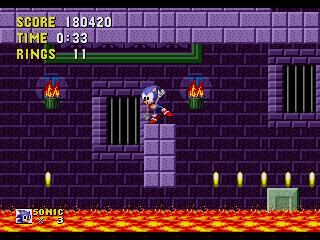 Just like Sonic 2, this game has been considered to be "cursed" for a long time, with many people trying to make runs and giving up halfway.